A couple of days ago Andy took the boat out fishing, and what a trip he had!!! He called me as he was coming in and we went down to meet him at the harbour. We watched and vaguely helped him bring the boat in. He has a really ingenuous way of getting the boat back onto the trailer using a winch. This means we don't need some swanky 4x4 and he can tow and launch the boat using his wee golf, even when the slipway is thick with sea lettuce. It's very clever and I felt really proud watching him, knowing how much thought he had put into the problem of launching and retrieving the boat single handily. This was his catch, the best result I have ever seen, so the best fishing trip in well over a decade! You'd think Benny had caught them! 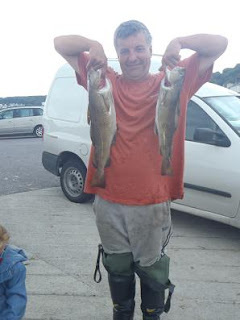 As well as 2 cod he also caught 4 pollack and a small ling. we washed them down in the garden and filleted them also. Andy went off to drop a heap to some friends of ours. I put the dinner on and Benny refused to come in, he still wanted to investigate the fish some more. I found them like this when I went to get him in for dinner. Another neighbour we gave some mackerel to gave us strawberry's and cream in return, oh yum! These beautiful artichoke's a friend gave me from her garden. Oh I love artichoke's! These cakes we baked while Andy was out fishing, we think they look like 'real cakes'. Hmm yum, what have you been eating of late? That is quite the bounty. I love to see what our beautiful earth provides. We are currently devouring our garden treats. They are string beans, squash, zuccinni, cucumbers and an incrediable amount of tomatoes. I am getting 6 huge ones off the vine every day. I just might learn to can them. I would love to be close to the sea to be able to catch our own fish, it is the one thing I find really hard to source in the Midlands, good quality, ethically caught fish. I actually feel rather hungry now reading that post!! Btw, what exactly do you do with artichokes?? I keep meaning to email you- I've been thinking of you and will write this weekend! What a catch! I'm sure he must have broken every EU fishing quota in the book!